My only request for this whole "let's buy a house" thing (besides a yard for the dog, and a good neighborhood that I wouldn't fear for my life in while he was away on deployment…which then of course meant my beloved husband had to raise his, I mean, "our" price range…oh and an extra bedroom to house my sister), the ONLY thing I wanted was a dining room big enough to extend our table. I love my table. It is the perfect size and extends into a square that seats 8 people and it was the very "real" first thing I bought by myself with my "big girl" job money. Anyways. When I walked into this house I LOVED the dining room. 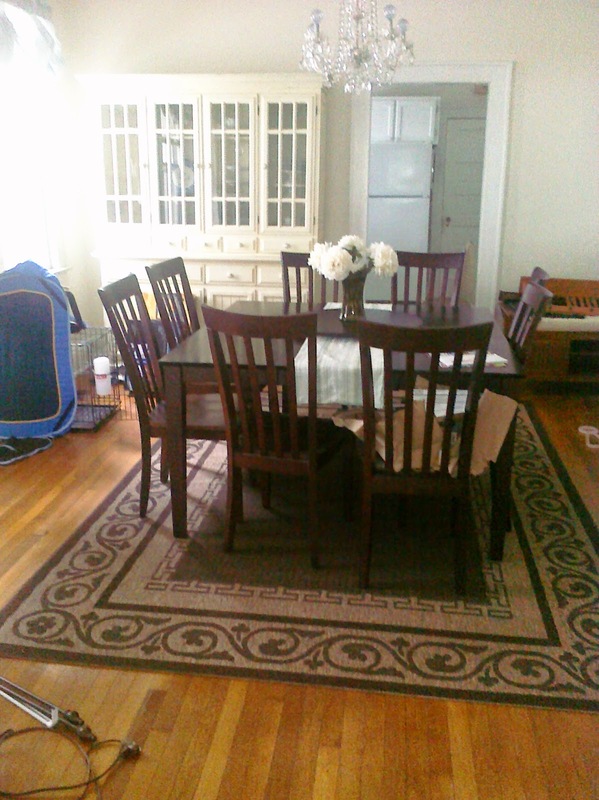 The hubs thought it wasn't going to be big enough for the table, but it was by far the biggest dining room we had seen. 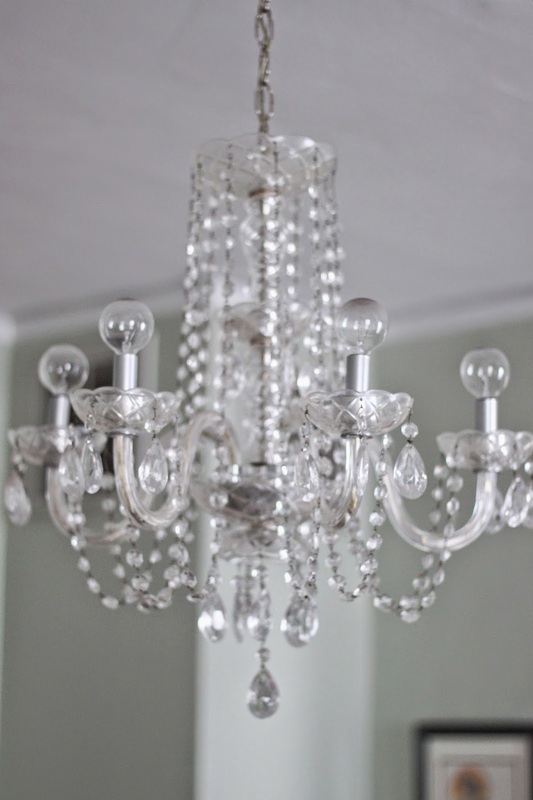 Then, I saw the chandelier and 9 10 foot ceilings and picture rail and my whole heart was pumping like crazy. Yes, yes, yes. All that…when originally, it looked like this. I was so, so in love. In any case, I convince A that the dining room was way bigger than he thought, it was just filled with tiny furniture and so many random plants. We moved in and I triumphantly sent him this cell phone (pre-iPhone) photo while he was on deployment, amidst boxes and ladders and unpacking and all. And, it remained that way for a while. Until we filled the room with all sorts of other furniture. Though this room hasn't changed much throughout the time we've lived here, I have done a bunch of projects. The first was updating the chandelier a bit - I made the lights sit a bit lower, sprayed the stick parts silver, redistributed the hanging crystals, removed the hurricanes that obviously didn't belong, and used round bulbs instead of candlelight looking ones. 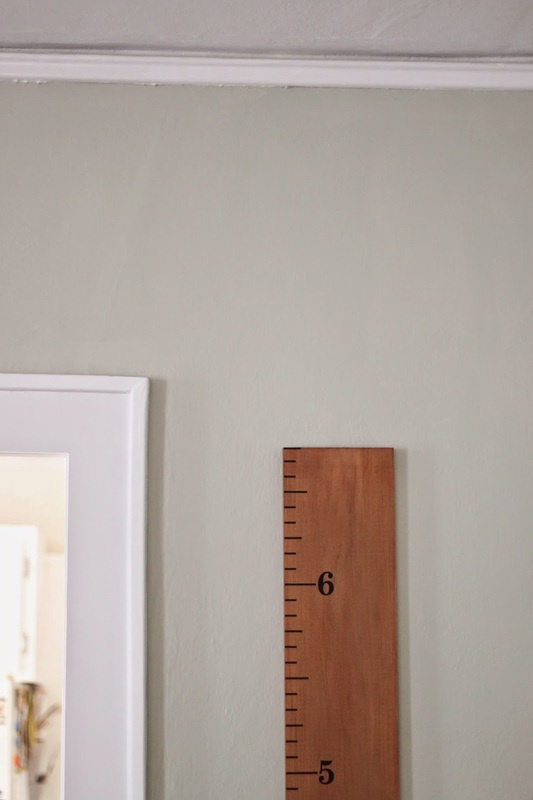 And not too long ago I made that growth chart, which conveniently also highlights how tall those ceilings are. And one of my most popular projects ever…my wine rack. Bonus! Hangry baby being fed in the kitchen…and the begging dog that is ever-present for meal time. I am super sad to be leaving this room behind. Mainly because we truly will be leaving almost everything in it behind in storage. Neither of those hutches or piano are going to make the cut for the trip to Japan, but I LOVE THEM and will not part with them, so to storage they go. We've hosted countless family dinners here, big and small, parties, play groups, holidays and coloring sessions. When it comes down to it, it really is the center of our home - which isn't all that surprising for us food-minded folks. Just like everything about this house, I find it comforting and reassuring, and will miss it greatly. …and the kids love this room too. Mainly because it means food. All the time.